Described by the organisers as “a feast for those who seek to stimulate all their senses to the point of near overload” the Mount Everest skydive took the participants breath away – literally. After becoming the first woman from her country to skydive over the world’s highest mountain, Scottish born Jane Dougall was asked if she would ever do it again? However she did admit that it had been the most incredible experience, absolutely spetacular views and the experience of a lifetime. A trio from Britain, New Zealand, and Canada were the first people to accomplish the feat and so get their names into the records books – Holly Budge, Wendy Smith and Neil James respectively. They fell at speeds reaching 140mph, hurtling past the highest ridges of the snow-laden Himalayas, before each released a parachute, made three times the size of a normal canopy to cope with the thin air. The jumpers wore oxygen masks to prevent their lungs from collapsing as they fell. Wearing neoprene underwear was compulsory — to prevent them from being frozen to death! To Holly this experience was the most perfect 30th birthday present! “Combine the visual impact of looking onto the summit of Mt. Everest and some of the other highest mountains in the world and freefalling past them; this adventure is a feast for those who seek to stimulate all their senses to the point of near overload. The 8,000ft wall of Nuptse and Lhotse which has an average height of 26,000ft are dwarfed by Mt. 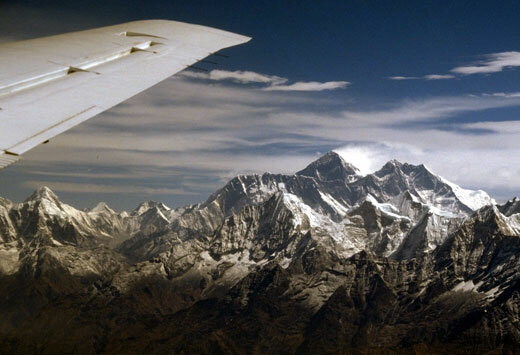 Everest behind at 29,035ft. The picture is taken from 25,000ft. This is 4,500ft below our jump altitude,” they say. Yesterday, the name Mount Everest seemed to pop up everywhere. First of all I watched the film ‘Touch the Top of the World’ which was the documentary film of Erik Weihenmayer’s journey to Everest from his youth when he started going blind, to his family’s battle that he have a normal childhood and not be packed off to a blind school, through the wrestling days and the beginning of his love of climbing, the teaching, and meeting his wife-to-be, meeting P.V. Scaturro, the team leader, and the actual ascent of Everest. The film showed eloquently the difficulties he had and the amazing support he had from his team of good friends. I mean, imagine going up one of the climbing ladders with crampons on your boots, holding onto ropes with both hands and not being able to see the next rung… Being told that he has to jump a crevice and that he has to take a run and jump as far as he can because if he doesn’t make it he will definitely fall to his death – and not even being able to see exactly how wide the gap is and where exactly to take off. It beggars belief. It is an amazing story. Did you know that only one in six people who try to conquer Everest actually summit and get down alive? There are two dominating factors when attempting Everest – “ambition and fear. Ambition is the overwhelming desire to get you to the top, and fear is what keeps you alive”. This was advice that P.V. gave Erik in the early days when he was struggling in the ice fields. Because of Erik it had taken them 13 hours to get over the ice fields on one of the practice days – when in reality they HAD to do it in 6 to get to the next base camp. There is an old Tibetan saying: “The nature of mind is like water; if you do not disturb it, it will become clear.” In other words, when taking on a challenge, clear your mind of expectation and take it one step at a time and this is what Erik did. You need 6 – 10 weeks on Everest doing practice climbs, getting to base camp 2 and back, base camp 3 and back, base camp 4 and back before you make the final challenge. This is absolutely vital to help you acclimatize. Technically Everest is not as challenging as some of the other Seven Summits, but it is the altitude that can kill you. As you all know from my previous article, Erik summited and got down in one piece. … and then I heard about Jane Dougall. Who is Jane Dougall? She is a reporter for Channel 5 News amongst other things. They have had to have suits especially made with the capability to attach oxygen masks because the air is so thin at 29,500ft. It will be -45* when they jump out of the plane so not only will the air be very thin but they will need to be protected from the extreme cold. They are expecting to jump early next week – I will keep you posted, but you can google her yourself and read her blog. Thanks to seracfilms for the video. As extreme as you can get, in many senses, wingsuit flying is right up there with the other extreme sports and now I hear of people practicing their ‘hobby’ so as to create a record – well done guys, great effort. Thanks to Carlos Mayorga of the Salt Lake Tribune for reporting this story. ‘For Scott Callantine, sky diving is more than a hobby: It’s freedom. The 38-year-old from Seattle, who in a period of 18 years has logged almost 4,000 jumps, including 400 in a wingsuit, was one of several sky divers who set three Utah sky diving slot-perfect formation records over the weekend above Tooele County. The men set the state record in a 10-person open diamond and nine-person closed-diamond formations, all flying in a formation within 24 inches of their pre-assigned positions, breaking state records previously set by a group of only six, said Stockton sky diver Douglas Spotted Eagle. The group also set a new nine-way vertical formation record, a technique that has never been attempted in Utah, he said. Spotted Eagle brought in wingsuit pilots from across the country for the attempt. Callantine came close to setting a world record for nonpowered human flight in a wingsuit, descending with five others from a plane 22,000 feet above Farnsworth Peak in Tooele County on Sunday. Strong head winds hindered the attempt – Callantine’s impressive 6-mile, four-minute descent was just short of a world record, Spotted Eagle said. The men, wearing special nylon suits that allow them to fly across the sky, were hoping to reach the Tooele Valley Airport, a distance of nine miles. But for Callantine, who jumps dozens of times every month all over the U.S., wingsuit sky diving represents much more than breaking records. Justin Shorb, 27, of Salem, N.H., who has been sky diving for 10 years and wingsuit sky diving for three, founded Flock University, a Massachusetts-based school that teaches sky divers to be wingsuit pilots. Because of the local popularity with wingsuit sky diving, Flock will soon open a branch in Tooele, Shorb noted. Wow that will be an amazing feat – I’ve included a YouTube video put together by mccordia which shows two wingsuit flying formations, one with six people and the other with seven – so I guess the attempt to fly a formation with 71 people later in the year is going to be a truly world beating record that won’t be broken for many years. Having personally never ‘flown’ in a wingsuit I am intrigued to note the versatility and manoeuverability of the wingsuit flyers in mccordia’s video which makes me think that the formation of 71 flyers is a possibility – good luck guys.